Ivy, who is a goose, and Randolph, who is a beaver, find their friendship put to the test when Ivy is invited to an all-girl sleepover and Randolph is not. He feels left out. Ivy’s excitement about the upcoming party is too much for Randolph. Suddenly he feels sad and jealous and he decides to make Ivy feel just as horrible as he does. Amusing illustrations and a charming storyline will help young children understand that not-so-nice feelings are a part of life and good friendships will endure. Especially great for sharing one-on-one or with a small group, the format (which includes thought clouds and conversations) may be somewhat awkward in a large group setting. 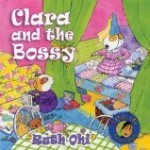 Clara and the Bossy is one of three picture books about a guinea pig called Clara. She loves purple and triangles and tuna sandwiches. She is thrilled when another girls suggests that they should be best friends. Clara admires Madison and is excited to go to her house but when it is time to clean up Madison’s bedroom, Clara is disappointed when Madison directs Clara to take care of putting the toys away. The following day, Madison points out that Clara wears her favourite purple dress every day. Later in the week she comments on her tuna sandwiches and is unimpressed when they are cut into triangles rather than more exotic shapes. When Madison turns her attention to one of Clara’s classmates and makes an unfriendly comment, Clara is prompted to take stock of the “friendship.” The following day, Clara returns to school and decides to be herself despite Madison’s scornful remarks. Clara discovers there many children at school who share her enthusiasm for tuna and triangles. Before long, Madison decides to join the fun. An enjoyable story with a worthwhile anti bullying message, Clara and the Bossy could be used to encourage children to discuss friendship, conflict resolution and bullying.